Have a large number of documents to duplicate and want to copy these files with an easy and efficient way? The best duplicate file software-AOMEI Backupper Standard will help you out in Windows 7/8/10. File duplication, also named file copy, means you can copy files from one location to another one to create a new file which has the same content as the existing file. The file duplicates is the same as the original one as long as the source file not changed yet. Copying file will copy all the information about the file, including the file format, file size and the content of the file. File copying is common in our daily life. All Windows operating system (OS) offers the service to duplicate file, you can use copy and paste or drag and drop methods for copying file. These two ways are the traditional way. Share files with our friends or family. Backup your important documents in case of data loss. However, the traditional copy way cannot meet your demands sometimes. If you have a plenty of data to copy with the drag and drop way, you will be spend a lot of time to finish. Is there a better solution to duplicate file with a time-saving way? Fortunately, the answer is positive. There are so many utilities to duplicate file for Windows users, How to find the best file copy software for you? Through market validation and user recommendation, compared with other similar software, AOMEI Backupper Standard as the best free file duplicate software, will copy file easily and efficiently for Windows operating system users, like Windows Vista, XP, 7, 8, 8.1, 10. And most important, you are allowed to sync file to local hard drive, external hard drive, SSD, network share, even the cloud. 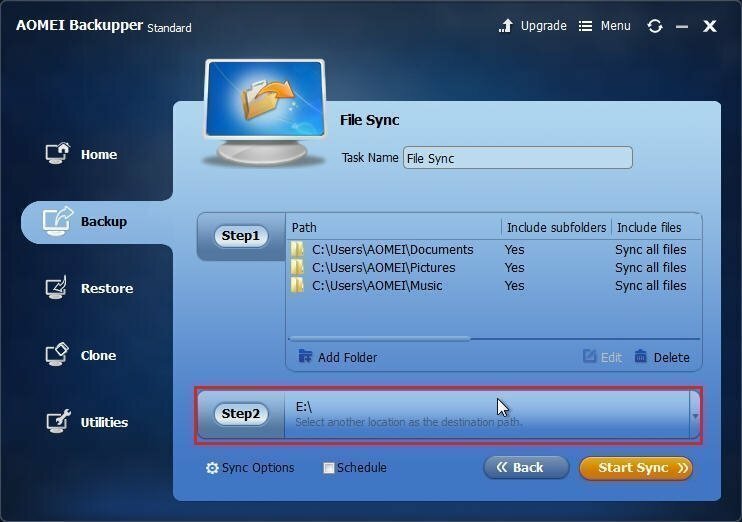 AOMEI Backupper Standard offers you several ways to duplicate file: file sync, clone partition to copy all the files on it, or file backup and restore. And the file synchronize feature will be your best choice to dupliate file. How to Duplicate File from One Location to Another? In order to show you how to duplicate file with the best duplicate file software, we will give you an example in Windows 7. The below steps are also applies to Windows 8/8.1/10 computer. Now, you can free download AOMEI Backupper Standard to have a go. 1. After installation, launch the best file transfer program. 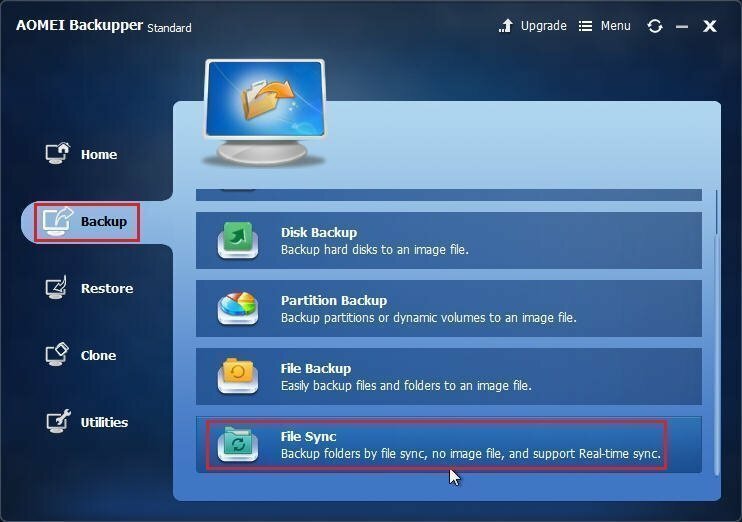 In the home window, select Backup at the left side, then choose File Sync. 2. To differ from other file sync or backups, you could edit the Task Name to identify the task. 3. In theStep1, click Add Folder to choose which files could be duplicated. Tips: If there are some files you don’t want to dupliate, you can edit or delete these files. 4. In the Step2, select a destination location to save these files. Tips: you could create schedule file sync with Schedule option; comment and enable email notification with Sync Options. 5. Click Start Sync to duplicate file from one location to another. After a moment, you will find all these files have been duplicated to another drive with the best duplicate file software. Furthermore, AOMEI Backupper Standard allows you to clone entire hard drive with the operating system, installed programs, settings, and user files, etc. backup system, partition and hard drive, and more. The Professional edition will give you the ability to real time sync to network, do file filter settings, command line backup, and so on.